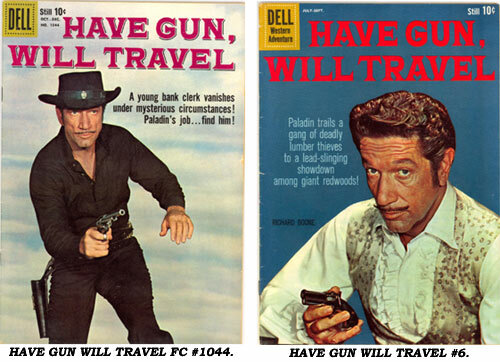 One of the best adaptations of a TV western to the comic book format was Dell’s HAVE GUN WILL TRAVEL with stories and art extremely faithful to Richard Boone’s Paladin character. 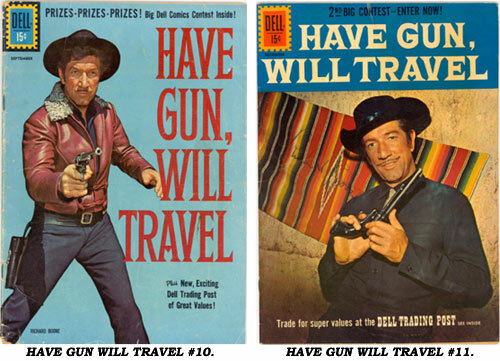 Although “Have Gun Will Travel” began airing on CBS in September ‘57, it was August ‘58 before Dell issued HAVE GUN WILL TRAVEL #1 as Four Color 931. A second “test” issue, FC #983, was dated nearly eight months later, April/June ‘59, with FC #1044 (#3) coming out in Oct./Dec. ‘59. Seeing successful sales with all three, Dell began regular numbering with #4 in Jan./Mar. ‘60. HAVE GUN… was then published quarterly through #14 (July/Sept. ‘62), even though the TV series continued on until August ‘63. 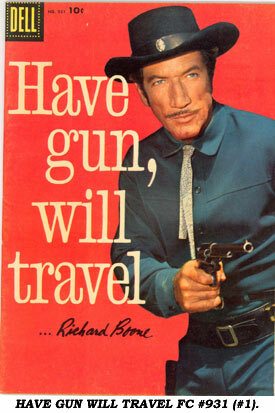 Every issue featured a terrific photo cover of Richard Boone as Paladin. As noted, the exceptionally exciting western artwork captured the rough essence of the Paladin character. Italian born Alberto Giolitti (1923-1993) drew his first comic in Italy in ‘43. After WWII he moved to Argentina where he worked for publishing houses there, then emigrated to the U.S. in ‘49 and began a collaboration with Dell, producing art for ZORRO, CISCO KID, TALES OF WELLS FARGO, GUNSMOKE, LAREDO, SGT. PRESTON and others. He returned to Italy in the ‘60s. Among the many artists who worked for Giolitti’s studio was Siena, Italy-born Giovanni Ticci (1940- ). 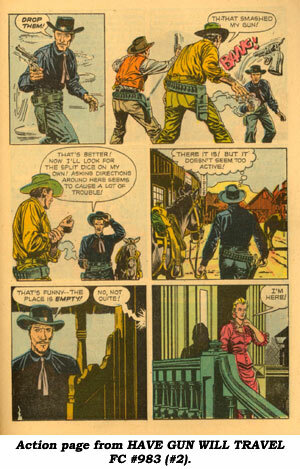 Ticci joined Giolitti in ‘60 and supplied artwork for HAVE GUN… as well as issues of GUNSMOKE, TALES OF WELLS FARGO, LAREDO and others. Among other artists who contributed to HAVE GUN…was Ray Bailey (1913-1975) who later drew the TOM CORBETT, SPACE CADET comic strip (‘51-‘53). Bailey also worked on Dell’s GRAY GHOST, BOOTS AND SADDLES, RIPCORD, etc. Nicholas Firfires (1917-1990) also contributed to HAVE GUN… along with several other Dell westerns. Unfortunately, Dell had a “no signature” policy for their artists, so it’s often difficult to be exactly sure who drew which issues. However, some artists’ work, such as Giolitti’s, are very distinctive and easy to recognize. It comes as no surprise that the super-prolific Paul S. Newman (1924-1999) wrote a great deal of HAVE GUN… comic scripts, as he did for dozens of other Dell westerns. In Fine, THE COMIC BOOK PRICE GUIDE lists FC 931 (#1) at $36, #2, 3 at $27, with #4-14 at $24. More than many other of Dell’s comic adaptations of TV shows, HAVE GUN WILL TRAVEL is a superb extension of the TV series.